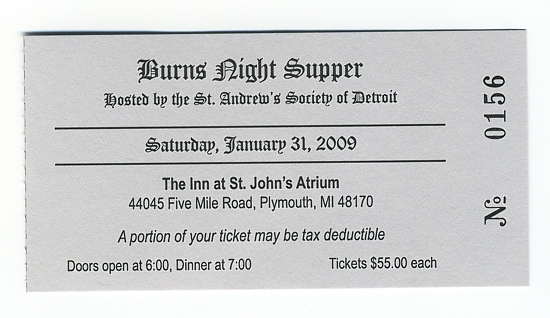 William Barclay of Detroit called thirty-five of his fellow Scotsmen to his home on Saint Andrew's Day in 1849, determined to form a benevolent society through which they could "relieve want or distress of natives of Scotland and their descendants" as they settled in Detroit. At that first meeting, the men selected a committee from among themselves to write a constitution and by-laws for the new St. Andrew's Society. These documents were made official at their signing on the second meeting of the St. Andrew's Society, which was held at the Merchants Exchange Hotel on the evening of December 16. The members selected James L. Lyell to be their first president. During the nineteenth century, the society initiated 618 members from both Detroit and Windsor. At the city began to grow and develop with the emergence of the automotive industry in the start of the twentieth century, the St. Andrew's Society likewise expanded. Between 1900 and 1908, the society initiated more members than it had during its first half-century of existence, boasting over 1,500 members by the close of the first decade of the twentieth century. As the society's membership continued to proliferate, it became clear that it needed its own meeting area. On 3 August 1907, the cornerstone was laid for St. Andrew's Hall at 431 East Congress Street in downtown Detroit. The St. Andrew's Society owned the building until it was sold in 1994. 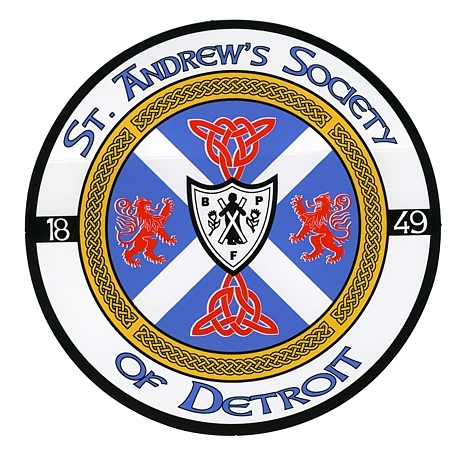 The oldest benevolent organization in Michigan, the St. Andrew's Society of Detroit has expanded its mission "to promote Scottish heritage in Metro Detroit by serving the Scottish-American community and by celebrating both traditional and contemporary Scottish culture". The Society upholds the fundamental Scottish values of benevolence, integrity, civic responsibility, patriotism, and respect for other cultures. It seeks to nourish the Scottish identity by fostering a spirit of philanthropy, fellowship, and volunteerism while assisting the distressed and unfortunate both locally and abroad. Besides providing relief to their Scottish brethren, the Society works to foster and encourage a love of Scottish history, culture, and national games, particularly among the younger generations. The Society also promotes knowledge about the contributions Scots have made to the culture of North America. The Society holds monthly membership meetings on the first Monday of every month from September through June. All persons age 18 or older are eligible for membership, so long as they have sine Scottish ancestry. 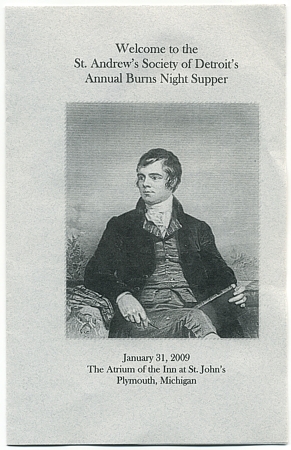 Its annual highlights include a formal dinner on St. Andrew's Day in November, a Burns Night celebration in January, and a Tartan Day ceilidh in April. The Highland Games are the focal point of the summer, the result of a year's worth of planning and organization. 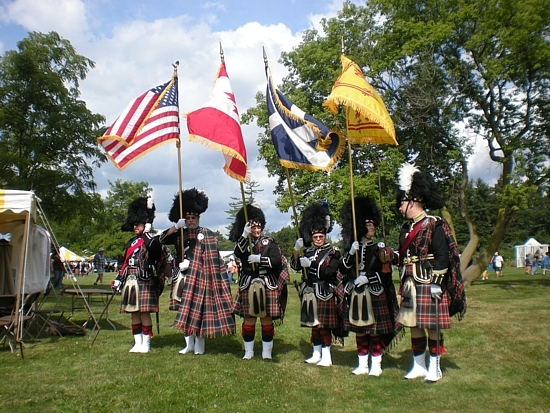 Hosted annually since 1850, the Highland Games of the St. Andrew's Society of Detroit are the oldest continuous Highland Games in North America. Put on entirely by volunteers, the Games include an opening ceilidh and feature a delightful mix of Scottish history, pageantry, music, and athleticism. 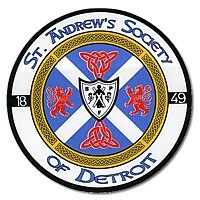 In 1992, ten men and women of the St. Andrew's Society saw a need for an added level of formality within the organization. Together they formed the St. Andrew's Royal Scottish Honour Guard, an auxiliary organization which would preside over the presentation of colours and serve as an official presence at the Society's formal functions. The Honour Guard's spectacular pageantry quickly endeared it to the community, and soon it was receiving requests to appear at weddings, funerals, parades, and other types of ceremonies. 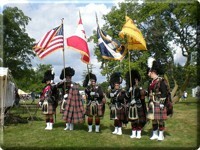 The Honour Guard regularly bears the flags of the United States, Canada, Great Britain, Scotland, the Royal Banner of Scotland, the State of Michigan, and the City of Detroit.